Dr. Evi Margaritis kindly sent me the following poster (“Exploring the Everyday of Frankish Corinth: Households under the Microscope”) presented at the Byzantium in Transition, 2nd International Workshop. The Middle-Late Byzantine Era, 12th-13th Centuries, held on Paros May 24-26, 2013. 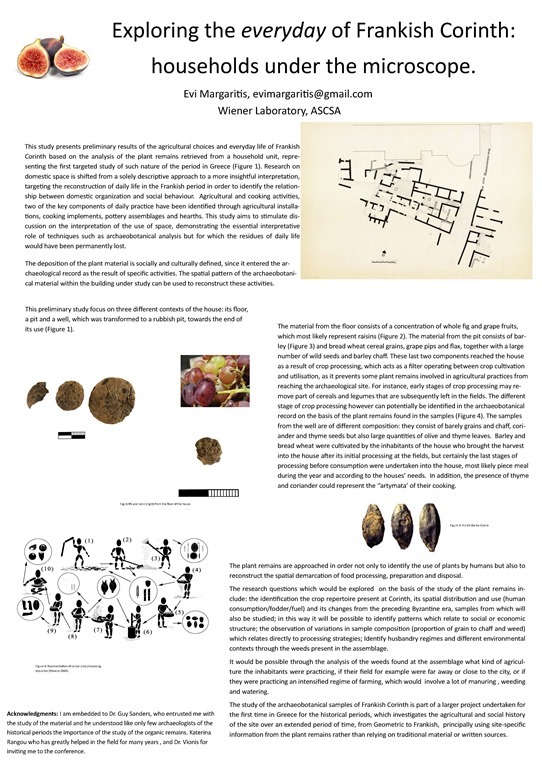 The poster presents Dr. Margaritis’ preliminary comments on her study of plant remains (figs, grapes, barley, wheat) from a pit, well, and house floors in Frankish Corinth and its potential for informing our knowledge of grain processing and daily life in the Frankish period. I have pasted a JPEG of the poster below, and a pdf version here (better for zooming in). It is exciting that this marks the start of a broad program of archaeobotanical analysis for the historical periods in Corinth. I hope there will be more to share as the studies develop.